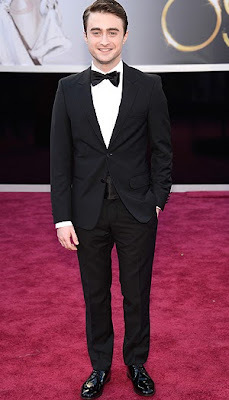 Why Is Daniel Radcliffe Looking So Skinny? 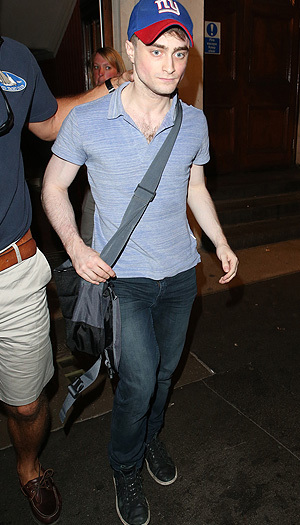 New photos of Daniel Radcliffe emerging from a stage door in London looking extremely skinny and pale may have had some fans worried, but fear not, Harry Potter fans! We have the inside scoop on why he's looking slightly gaunt. Daniel currently is starring every night in the Martin McDonagh play "The Cripple of Inishmaan" in London's West End. In the show, Daniel plays an Irish character called "Billy the Cripple," a 17-year-old orphan with a weakened left arm, a permanently stiff right leg, and an unrequited crush on a local girl. When a Hollywood film crew comes to town to scout talent, the young dreamer sees it as his opportunity to escape his formerly dreary life. The revival opened last month to rave reviews, including the U.K.'s Guardian, which called him "a fine stage actor with a gift for playing social outsiders" and Variety, which said he "considerably increases his range" with this role. But regardless of the raves or reasons, at least one outlet wrote on Friday about how the actor's appearance when emerging from the theater was "spark(-ing) concern." Omg! spoke with Radcliffe's rep who explains that the star's current gig "is a very demanding role physically." As for why Daniel may have looked serious for a brief moment when this pic was snapped, his rep adds, "at every night's performance, there is large crowd at the stage door and he takes the time to sign autographs and pose for pictures at length. Regardless of the extreme London heat wave." Since the end of the Harry Potter franchise, Daniel has spoken many times about how the roles he is picking are intended to stretch his range and establish himself as a very serious actor. And this isn't the first time Radcliffe has earned rave reviews on stage. In 2007, he appeared naked in a revival "Equus" in London and later reprised the role on Broadway in New York City. And in 2011, he sang and danced his way into people's hearts on Broadway in a revival of the musical "How To Succeed in Business Without Really Trying." Daniel has remained busy in his involvement with several charities that are important to him. He's a major supporter of The Trevor Project in the U.S., which provides a suicide hotline for gay, lesbian, bisexual, and transgender youth. In the U.K., he just shot a new PSA for "Get Connected,"an organization also dedicated to helping young people. Daniel's highly-anticipated Beat Generation film, "Kill Your Darlings," in which he plays poet Allen Ginsberg, is set to hit U.S. theaters in limited release on October 18, with a national roll-out to follow.